Walk in the labyrinth of interconnected rooms, and you will see the full-sized gondola in the middle of the shop, overflowing with books then along to bathtubs filled with books and sleeping cats you will find a doorway leading straight out onto a canal where the water level seems a precarious few centimeters away from spilling into the room. It happened to us to get there in a rainy day and the owner was moving all the books from the floor to bathtubs and shelves because of the danger of high water level! Keep searching (for books and memorable shots) and you’ll find yourself in a tiny quiet courtyard which hosts a staircase made entirely from books. Climb up to the top for a lovely view onto the Venice canals. You may feel literally overwhelmed by books. New and old, romance and science fiction, best sellers and b-series novels, you can find anything here if you are patient enough to search. 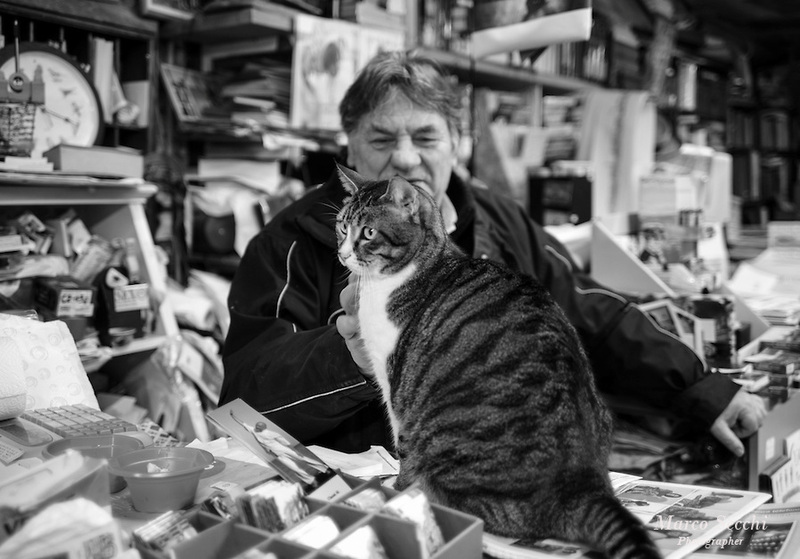 It’s possible that you won’t be able to find any specific books given the bizarre nature of the piles, or you may don’t like the smell of humidity or second hand books, but you should include a visit to Acqua Alta into your Venice tour anyway. FRANCO IS A WONDERFUL GUY AND AN AMAZING LIBRARIAN AND EDITOR! Acqua Alta or the high tide in Venice is a way of life and people live with it....but few things still surprise me! 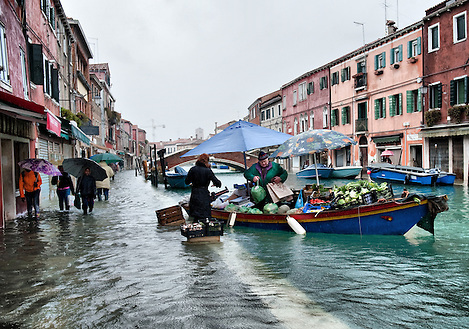 Here a grocer from St Erasmo sells his vegetables in Murano during the high tide.